The regulator is small intelligent installations which consist of a sensor input, a digital indicator and a regulation output. There are regulators for diverse measurement works. Regulators are set through its own keys. Nominal values can be established to define the regulation process. Some regulators have also available a regulation output for normalized signals output which can be connected to a display system to control this process. Regulators are specially important in sewerage systems because of the strict regulations regarding this matter. Regulators can control the pH value in a drain and regulate this value to avoid any environmental contamination. pH regulators can also be used in fish farming or pools. Temperature regulators are used in air-conditioning sectors or in the control of water temperature. Thanks to the wide range of applications, regulators are mostly used in the industry and can perform works which require a PLC complete solution. 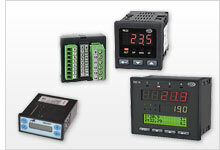 The temperature controller PCE-RE55 is a simple temperature controller for control tasks. The input signal of the thermostat PCE-RE55 is processed by thermocouples type J in different temperature ranges. Optionally the simple temperature controller PCE-RE55 can also be equipped with a PID switch. The temperature controller PCE-RE55 is a simple temperature controller for control tasks. The input signal of the thermostat PCE-RE55 is processed by thermocouples type K in different temperature ranges. Optionally the simple temperature controller PCE-RE55 can also be equipped with a PID switch. The temperature controller PCE-RE55 is a simple temperature controller for control tasks. The input signal of the thermostat PCE-RE55 is processed by the Pt100 sensor in different temperature ranges. Optionally the simple temperature controller PCE-RE55 can also be equipped with a PID switch. The industrial temperature regulator PCE-RE92 is designed for universal industrial applications with high demands. The controller has two slip universal and programmable inputs. Thus a wide variety of sensors can be connected to the controller PCE-RE92. Various control outputs are available.